Fun Fact: Sharon is an NEA Foundation Global Leadership Fellow, where she was able to travel abroad, participate in a field study, lead trainings on how to integrate global competence into a classroom instruction, advance pedagogy, and prepare students to thrive in the “flattened” global age. Follow Sharon on Twitter, @kkidsinvt, and on Instagram, @knitwalkswim. 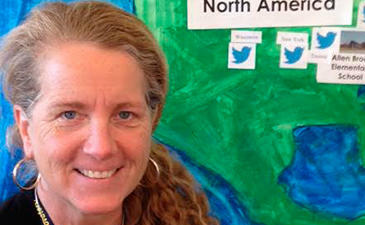 Follow her class on Twitter, @vermontkkids123.